Real wood cabinets give your kitchen an elegant, rustic appeal. Unfortunately, real wood cabinets are expensive. 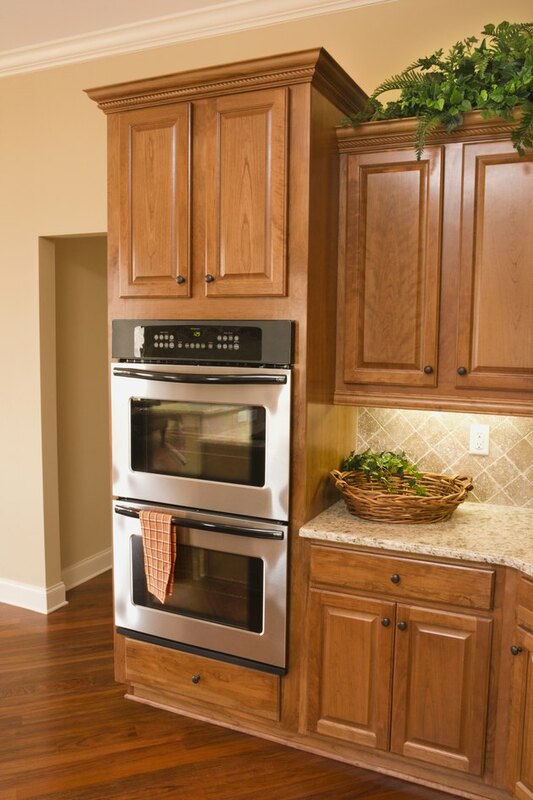 Plastic laminate cabinets have the appearance of real wood and are a more budget-friendly option. If you ever decide to change the color of your cabinets, however, you may run into trouble. A standard wood stain works well for wooden cabinets, but you don't get the same results when applying liquid stain to fake wood. Fortunately for those with laminate cabinets, gel stain works well on a variety of surfaces other than real wood -- allowing you to stain your cabinets without leaving them a streaky, splotchy mess. Give your kitchen added warmth by applying gel stain to your cabinets. Clean the cabinets well with a mild household cleanser and a washcloth. Sand the surface of your cabinets with 100-grit sandpaper. Laminate cabinets often have a slick finish. Sanding roughens the surface of your cabinets, helping the gel stain stick more easily. Dampen a washcloth with mineral spirits. Wipe down the sanded surface well, removing all of the sanding dust left behind. Let the cabinets dry. Open the can of gel stain. Dip a clean, lint-free cloth into the gel stain. Wipe a thick layer of gel stain across the cabinet. Wipe away the excess gel stain with a second lint-free cloth. Continue applying the gel stain and wiping away the excess until you finish staining the cabinets. Let the gel stain dry. Apply a second coat of gel stain if you do not achieve the desired results with the first application.